Colorful accessories, furniture, and decors are very essential for a house with a white and black theme or white and wooden brown theme. For this bright colors will enhance the look of the interiors and provide livelier and lovelier look as well. Today, we will check how these amazing designers create a more enticing view in the interior that has white and black concept. This house is named as the Restauro Villa Benvenuti. This house is specifically located at Rivarolo Canavese, Italy. According to the designer this house was restored in the year 2011. Definitely, you can see how the designer mix and match the bright colors to accentuate the white and black palette in every corners of the house. The styles and design of the furniture complements well with the flawless white and smooth texture of the interiors. 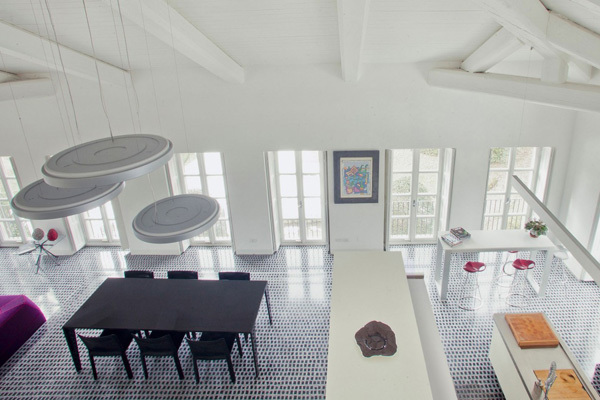 Let us scroll down the page and see the amazing areas of the house through the images below. 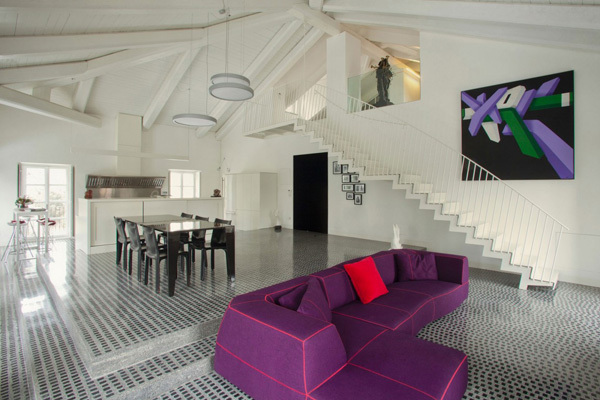 Purple sofa complements with the red flower chair set in the corner of this staircase in the living space. 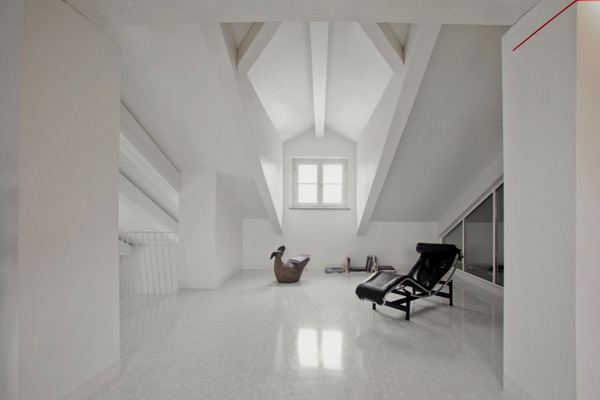 From the second floor, the different forms and shapes are highly emphasized in the living space in the first level of the house. 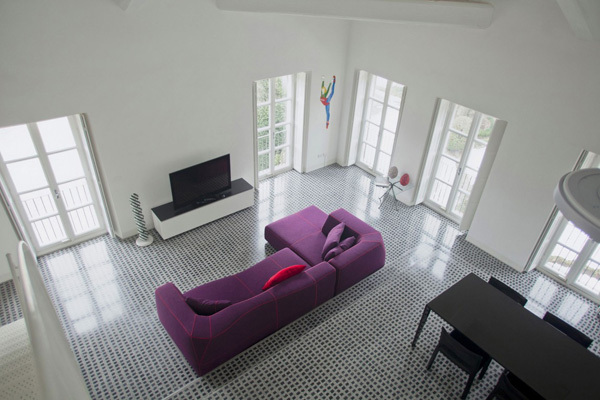 Dimensions and textures are carefully observed from the floors and ceilings of this living space. See how this amazingly elegant style of lights set in this living space adds attraction here. 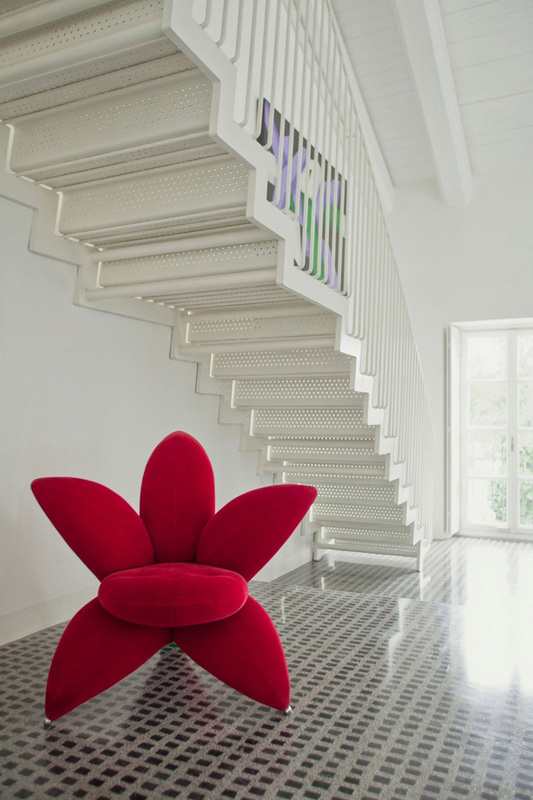 Look at this red flower design of the chair that exceptionally stands out in this spacious interior. 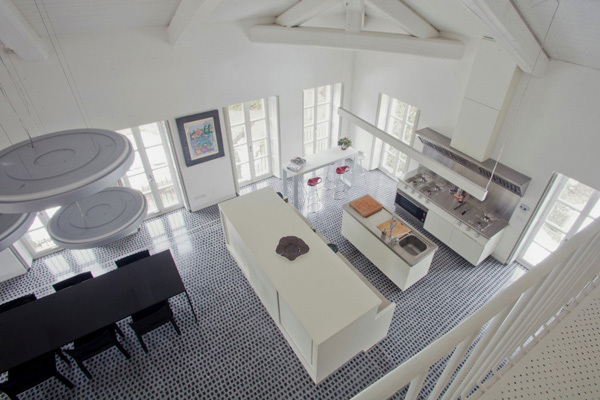 This neat and functional kitchen is also viewed from the second level of the house. 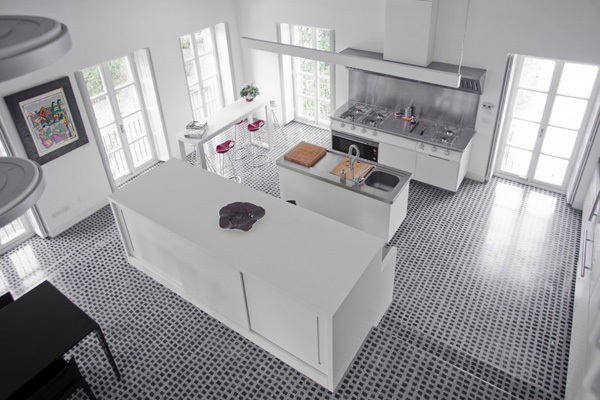 A closer look at the well-organized and modern design and style of the kitchen. Different shapes and dimensions are also seen from dining set, chandeliers and wall arts in this kitchen-dining area. Extraordinary shape and lines seen from the ceilings and windows are also observed from this area in the second level of the house. 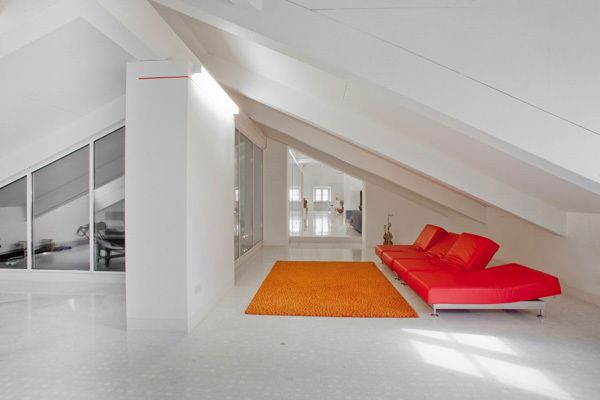 Here’s one of the most comfortable space in the second level where the client can enjoy the sustainable light. Here is another dining space where modern and classy design is well-experienced. 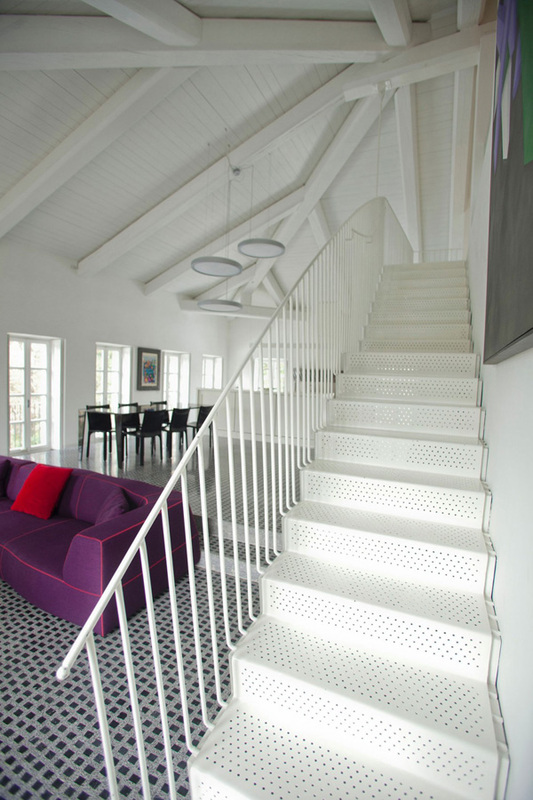 White and functional staircase also unveils its modern and clean style. 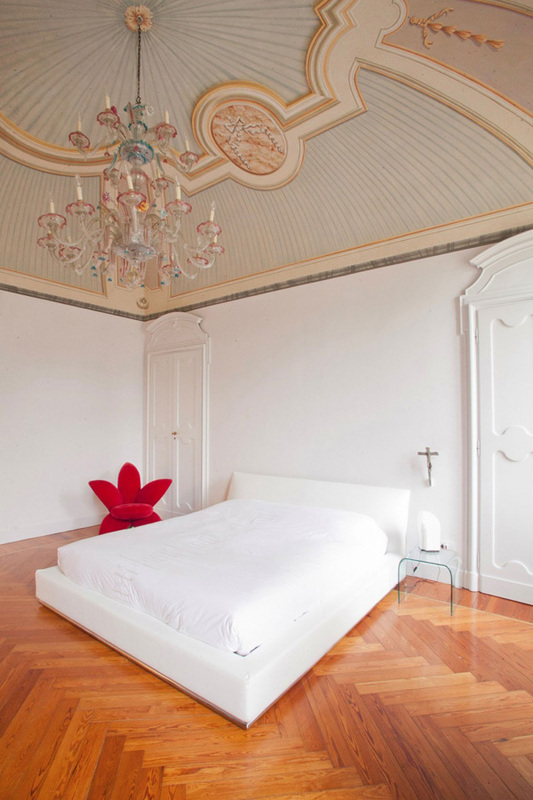 Even in this bedroom, the red flower designed chair complements with this white bed and unique chandelier. Here’s the spacious and white themed bathroom that also underline the importance of this classy and extraordinary chandelier. 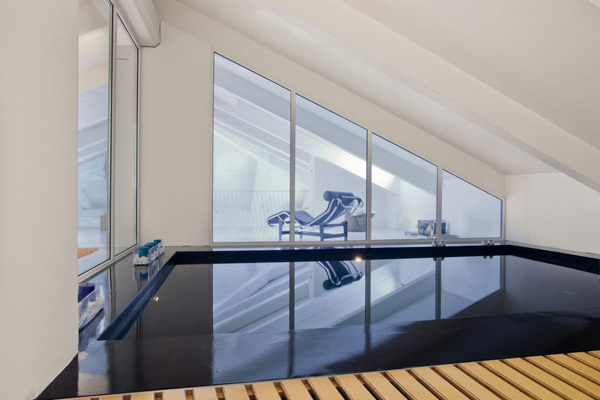 An indoor pool may certainly provide the most comfortable and relaxing space in the house. 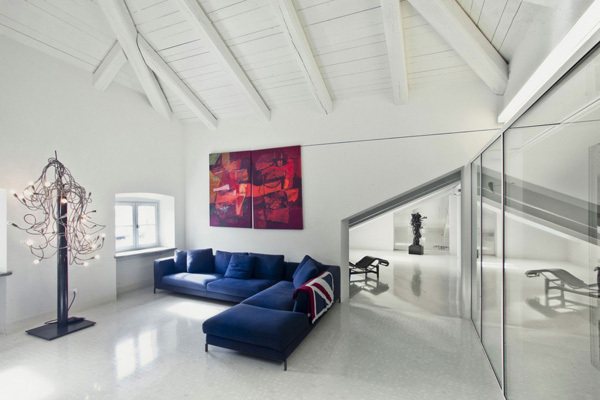 As we have witnessed the different fascinating areas of the house above, we can say that the Pietro Carlo Pellegrini Architetto brilliantly exposed the colorful furniture that stand out in the white and black themed interiors. From the living spaces to the bedroom, the designer successfully and consistently utilized the importance of the decors and furniture. I personally like the artistic and modern architecture and interior design of this house. I am pretty sure that you may utilize the designs of this house in your future house as well.